Games can be a bit of time sink — and time is a finite resource. For those of you living for the weekend (this weekend, in particular), we’ve come up with a few new indie games (and one classic) to try that won’t take up too much of your time or money. As fun as it is to dive deep into Open World/Action/RPG/Survival/Battle Royale extravaganza #284, not everyone has that kind of time. We get it… life happens, and you need to eat, shop, and maybe tend to pets or children. Sometimes you just want to have a good game to play that you don’t have to sink hours into. To that end, we thought now is a good time to spotlight some recently released indie games that’ll take a bit of your time, but not too much. The games themselves aren’t necessarily short (any game can be pumped for hours of playtime with enough effort), but they’re definitely not going to claim the same number of hours from you as, say, Kingdom Hearts 3, Sekiro, or Metro Exodus. They’re also all under $20, so they won’t drain your time or your bank account. This game, from an Argentinean studio, is one of those puzzle games that doesn’t demand you exert yourself too much. It makes you think, but the soothing music and visuals are so relaxing it’s almost the anti-stress. In this game, you navigate a 2D environment of shapes and lines, solving navigational puzzles. That’s about it. The rules aren’t complex, but the atmosphere makes the whole thing feel like an experience. It’s enjoyable, uncomplicated, and just lovely. If you need to chill this weekend, this is the game to do it with. ETHEREAL is available on Steam and the Humble Store for $9.99. It was originally released as part of the Humble Bundle last September. Playing puzzle games sometimes requires finding new ways around the rules, but Baba is You is about rewriting the rules. In this you play a… I wanna say bunny? Anyway, you play a creature called Baba who solves puzzles by literally rearranging the onscreen puzzle rules. For example, if you’ve got a rule saying “Rock is Push” and “Flag is Win,” Baba must push the blocks of the sentence around to read “Rock is Win,” so that it can instead win by running up to a rock. It sounds odd, and it takes a bit of getting used to, but it’s fun once you get the hang of it. It’s fun to have the rules of the game, rather than the environments, be the puzzle. It’s got a multitude of levels, so you might not necessarily finish it this weekend, but it’s both easy to put down and a joy to pick up again. Baba is You is available on Steam, the Humble Store, and the Nintendo Switch for $14.99. This game, in which you play a judge during the French Revolution, is a fascinating take on puzzles and procedurals. You must preside over various trials, determining guilt, innocence, and how a verdict will benefit you personally. The political climate is, as you might expect, an ever-present cloud over everything. It’s almost more of a strategy game than a puzzle, actually. You have to carefully manage your reputation with court cases, so that you’re not next to face the guillotine. It’s a tricky game, and may not be everyone’s cup of tea. But it’s at least worth trying out, and an easy game to slip into for a few hours. We. The Revolution is available on Steam and GOG for $19.99. According to the developer, the game will be released on Xbox One, PlayStation 4, and Switch later this year. We’ve already given our take on this game, and it’s not a new release, so consider it this list’s honorable mention. But still, it just won several accolades at the Game Developers Conference and the Indie Games Festival. So if you missed it last year, now’s as good a time as any to jump in. In this murder mystery game, you must discover the fates of the passengers who’ve vanished from the titular ship. It’s a lot harder than it sounds, as it requires you to pay careful attention to contextual clues, and make some pretty complex deductions to figure it all out. It’s got a juicy story, too. 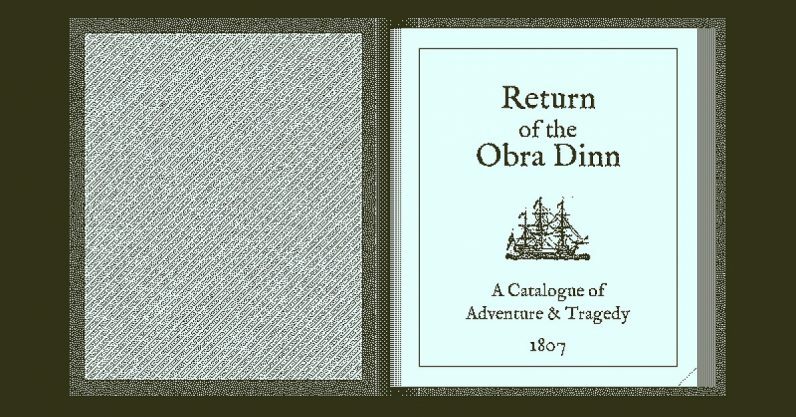 Return of the Obra Dinn is available on Steam, the Humble Store, and GOG for $19.99. Have a nice weekend! Let me know what you play!